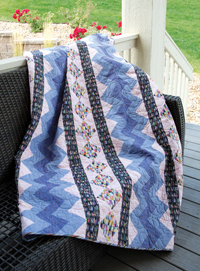 Quiltmaker‘s Lessons in Creativity takes you and a quilt design to a whole new level. Learn how to play with different color recipes, use a variety of quilting designs, create many interesting quilt options, enhance your sewing and quilting skills and so much more. Series 6 focuses on variations of Zippity Doo Dah, as seen in Quiltmaker January/February 2017. Look for all new episodes starting January 5, 2016.